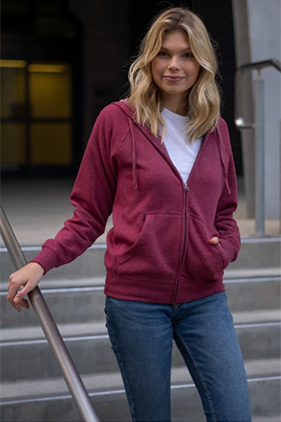 52% cotton/48% polyester 8 ounce raglan full zip hooded sweatshirt with 30 single polyester/cotton blend facing. Raglan sleeves. Unlined hood. Reverse cover stitch sewing. Twill neck tape. Tear away neck label. 1x1 ribbing at cuffs and waistband. Front pouch pocket. YKK antique nickel kissing zipper. Slim unisex fit.